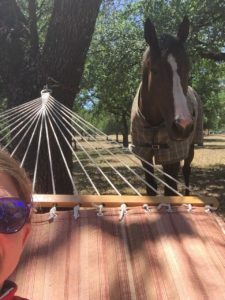 I first read a “30 Things….” post on 900 Facebook Pony and she got the idea from May As Well Event so I’m joining in the fun blog sharing. I feel like anyone who knows me may already know many of these things, but thought it would still be fun to share! 1. I like most any food, but I really do NOT like barbecue. Especially Texas BBQ. If it is smoked I really really don’t like it. Give me whatever sushi and I’ll at least try it. Asian. Thai. Indian. I have a low spice tolerance (I call this my Montana taste buds), but I don’t want anything to do with BBQ. 2. I went to Carroll College in Helena, Montana for my undergraduate degree and in many ways consider those four years to be the BEST years of my life! Everything was sponsored by my parents (to whom I am forever grateful), I had freedom, I had amazing friends, I learned every single day, and I lived in the most beautiful area of the country. What is not to love?! 3. I moved to Texas and the only person I knew was my friends’ grandmother (whom I lived with for a few months) in Fort Worth. People often think I moved here to go to grad school, but I moved to Fort Worth because I love the town and the people. 16 years later I think I still like it here. 4. I sew. Not quilts and such. I prefer to make clothes. I don’t give myself nearly enough time to sew, but I have three fancy schmancy Bernina machines and when I put my mind to it can make some beautiful clothing. When I got my colors with the hunt I ride with I made my own frock coat. Sadly, I left that coat at the cleaners just a little too long after changing jobs and they got rid of it. The saddest part of the story is that it had over $100 worth of buttons on it. You see, custom hunt buttons are like $8 each. SO SAD! 5. I have a ginormous family. My immediate family is normal sized, but my extended family is huge. I have 12 cousins on my Mom’s side. My Mom has about 75 first cousins and I’ve met nearly all of them and know some of them very well. I don’t know my Dad’s side as well, but he had 3 siblings and I have 7 cousins on my Dad’s side. My Grandpa’s side of the family on Mom’s side has a reunion every 4 years and there are usually close to 200 people in attendance. We always go somewhere awesome (Bend, OR; Glacier Park; Black Hills in SD; Jackson Hole WY. etc) and we spend 4 or 5 days together. We joke that we could drive from coast to coast of the U.S. and stay with family the entire way. I’m grateful for ALL of my family! 6. I’m obsessed with planners and I have been since at least middle school. Like right now I have 3 planners in action. 1 for work, 1 for “life” and 1 for horses. It is ironic because I’m not very good at actually planning, but I sure do like writing stuff down with fancy pens on nice paper. 7. I have a fancy pen collection. Pelikan. Montblanc. Waterford. Waterman. TBSI. I LOVE writing with fountain pens or even just nice rollerball or ballpoint pens. 8. 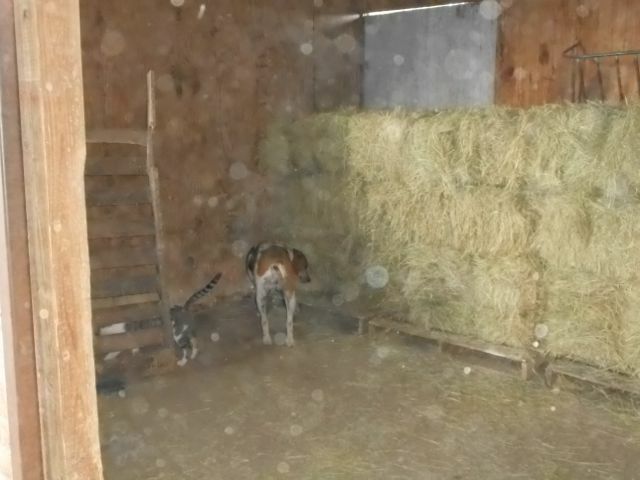 When I was a kid and would go with my parents to cuttings (horse shows) I would find every dog on the property and make friends with the owner. I loved taking them on walks and just petting them. It’s not wonder I grew up to be a crazy dog lady. 9. Before I met Boot City he had never really owned a pet. He had had a cat and his dad had a dog, but he had never really had his very own pet. My family continues to be astonished at our current pet collection and how tolerant he is of my obsession with animals. Clearly he likes them, too. 10. I played the piano for 9 years. I never got very good at it and really just continued to make my Mom happy, but I’m glad I learned how to play. I haven’t sat down and played in at least 20 years, though. 11. I don’t watch TV. In the recent 10 years the only shows I’ve watched were Downton Abbey and Outlander. I didn’t watch much TV as a kid so never really got into it. In college we would watch the Bachelor and Friends sometimes, but I can’t follow most TV convos to save my life. 12. I was a rodeo princess when I was in grade school. I was the Bucking Horse Sale Princess in 1991 or 1992. I had to model, answer some questions from judges, maybe give a speech and I think there was a horsemanship portion. My Mom made all my outfits and I was hands down the best dressed kid. The clothes my Mom made for me when I was growing up should be in a museum collection someday. 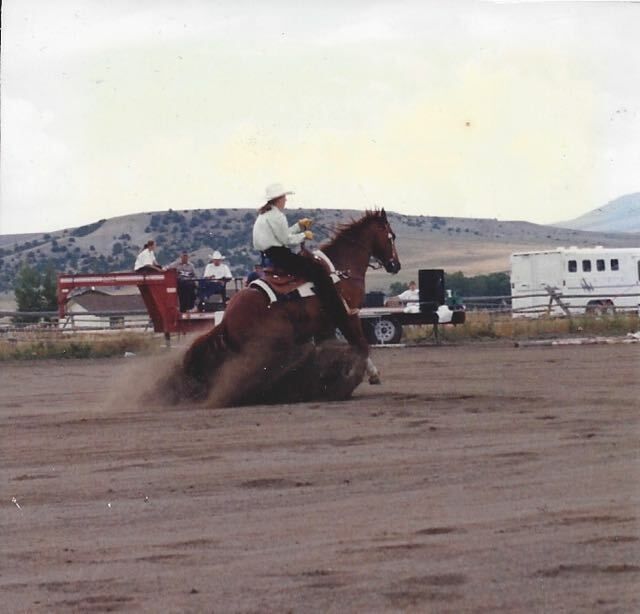 I thought for sure I would run for Miss Rodeo Montana when I was old enough, but by then I had completely abandoned rodeo in favor of showing Quarter Horses so it seemed weird to be a rodeo queen. 13. I hate and am terrible at cooking. My dad told me for years that no man would marry me because I can’t cook. I showed him when I married Boot City because Boot City is the most amazing cook I’ve ever met. He makes things with recipes that start with “day 1” instead of “step 1”. 14. I’m pretty religious, but like to mostly keep it to myself. I grew up Presbyterian and I went to a Catholic college. My Mom grew up Catholic, too. I consider myself a Christian and was a member of a Methodist church by my house for a few years, but didn’t feel very connected to Methodism. I’ve gone to a few other churches since then, but am pretty lazy about actually leaving my house on Sunday mornings. I read the Bible every day and I pray a lot, though. 15. My first vehicle was a 1993 2500 Diesel Chevrolet regular cab, long bed. My second (after I totaled the first one, oopsy) was a 1996 2500 Chevrolet extended cab, long bed (and a manual transmission). I only drove a pickup until I was in my mid-20s (I did have a brief interval with an Impala that my parents got me to drive when I lived in Minneapolis for a summer). I am, and always will be, a truck girl. 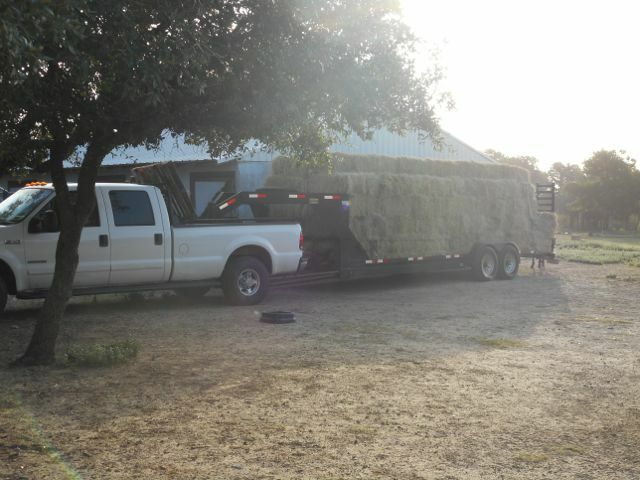 The pickup we have now is a 2002 Ford F-350 with 4 doors and a long bed, so Boot City drives that more than I do. I have to suffer with whatever Lexus lease vehicle we have at the time. I’m on my sixth or seventh Lexus and love the brand. Boot City works for Lexus so we get a sweet deal on them. 16. I never had a best friend when I was a kid. I had lots of great friends, but never a best friend. It really bothered me sometimes, but I had oodles of cousins who were (and are) my friends and I’ve actually gotten closer to a lot of people I grew up with now that we are adults. 17. I’m really outgoing and for many years didn’t have a very good filter before spewing my opinions on a subject. I like to think that my filter has gotten better, but I still tend to be pretty direct. I’ve just learned when I should keep me mouth shut. Most of the time. 18. I hate appointments. This is the primary reason I very seldom get haircuts, manicures, massages or any other similar thing that requires me to drive to some service provider at a specific time. 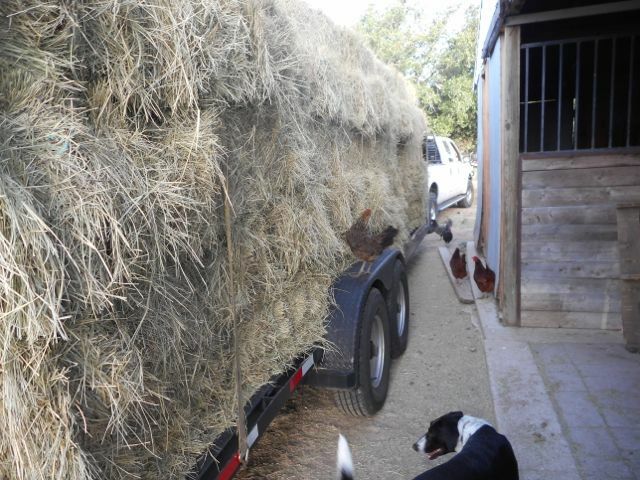 I would MUCH rather spend that time and effort with my horses/dogs/husband/friends. 19. I’ve ridden horses my entire life, but have only been jumping for about 6 years. I started taking Sterling to “A” shows in 2014 and we have both come a REALLY long way in those four years! It was asking quite a lot for a green horse to teach a green rider how to jump, but he’s been fabulous. We have been lucky to get some really great instruction along the way, too. 20. When my horsey bestie and I go places together people ALWAYS think we are sisters. She has been showing hunters quite a bit longer than I have and when I am at shows and she isn’t there people will start talking to me as though I’m her. We both find it hilarious. We went to France together a few years ago and got more or less the same reaction there. We assumed people would think we were a couple, but they assumed we were sisters. 21. My dad owned the auction market in my hometown until I was in middle school. He would often buy horses (and sometimes ponies) in the horse sales for me to ride for a few months then he would sell them at a later sale. I enjoyed working with them and increasing their value. And now I know that I may have saved many of them from a pretty dire fate. The one I remember best was a black pony we called Inky. He was a bit of a holy terror and liked to gallop everywhere. I got him slowed down and responsive to specific cues for each gait. I sure hope he went on to be a good pony for some kids! 22. The Budweiser Clydesdales came to our county fair around the time of Montana’s centennial in 1989. They were stabled close to where our 4-H horses were stabled so after we got our morning chores done we would go over to help out with the Clydesdales. I even talked my way into “riding” one of them! I really just sat on it and the handler led it to the wash rack, but somewhere there exists a photo and it was truly an amazing experience. I highly doubt they are able to let little horse crazy girls sit on them these days. 23. Today is Boot City and my 13th wedding anniversary. Happy anniversary to us! We didn’t have a fancy wedding, but it was a really FUN wedding! Definitely one of my very favorite memories. 24. I kept a diary from the time I could write (like, 1st grade!) until a few years after I got married. i don’t really know why I quit keeping a diary, but now I tend to write diary-esque things in my planner. I do keep a horse journal to record horse things. I find it can often help refer back to my horse journal when one of the horses turns up lame or ill or something. If I write things down I am more apt to notice a change. 25. I have a Bachelors and Masters degree in Communication, with an undergraduate dual major in PR and a minor in Business. Not like telephone communication, but human communication. I would go to college forever if someone would pay for it and support my horse habit at the same time. Hardly a moment in my life goes by when I’m not using some aspect of what I learned from my degrees. From everyday life, to work, to horsing, to general interactions. I’m so glad that I made the choice to change from biology to communication studies my sophomore year at Carroll. I always tested strong for math and science, but my heart just wasn’t in it. Some days I wish I had a career more horse-oriented, but I’m grateful that my career allows me to support my love of horses and showing. 26. I took Spanish for six years and can understand quite a lot, but am not very good at speaking Spanish. I would LOVE to someday live abroad and be immersed in a language, but it stresses me out to think about what I’d have to do with all my animals were that to happen. 27. I read a lot and my favorite author is Ayn Rand. I LOVED The Fountainhead and Atlas Shrugged. I also love pretty much everything I’ve read that Jane Austen and Leo Tolstoy wrote. I like modern literature as well, but it doesn’t seem to stick with me as much as the older tomes. It took me 6 months to read Anna Karenina, but it was so worth it. 28. My Mom got me my first subscription to Vogue when I was in 5th or 6th grade. I would read it cover to cover and drool over the beautiful clothing. She made all of my formal dresses in high school and we would usually pick out a style we like from a Vogue magazine, find a pattern that was similar (usually a Vogue pattern), then she would make the dress. The best one was a black pigskin dress she made for my Junior year Winter Formal. I think I still have it and it fit well into my late 20’s! 29. 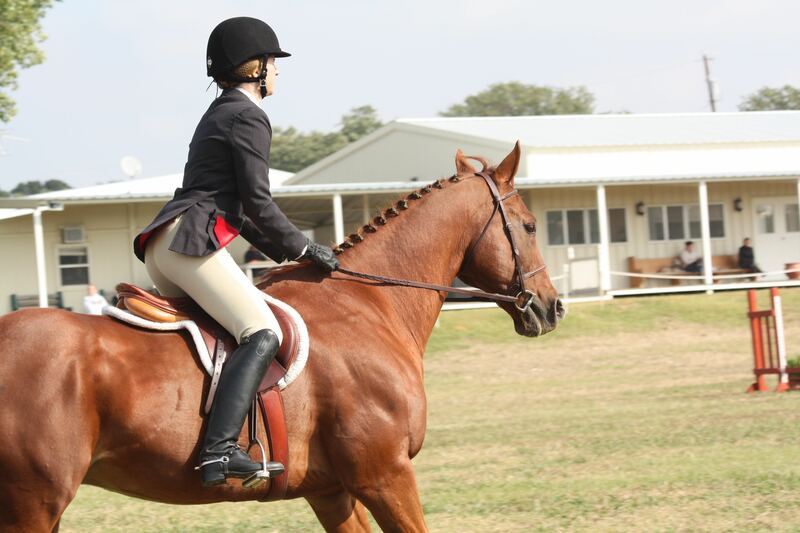 I mostly went to horse shows by myself the summer between my junior and senior year of high school and the summer after my senior year. I showed three horses those summers and I would haul them, get them situated in their stalls, enter my classes, braid or band manes, bath/clip/groom them and usually start showing on Friday morning by myself. We had lots of friends at the shows and I never felt like there wasn’t someone there to help me if I needed it. Mom would usually come on Friday afternoon or Saturday morning. I loved every second of it and was grateful my parents let me go. I would usually stay with a good friend whom I showed with or a trainer so I also had a blast hanging out with them. I can’t imagine any parent I know today letting their 17/18 year old daughter do that by herself! 30. This list was WAY harder to make than Amanda said it would be! 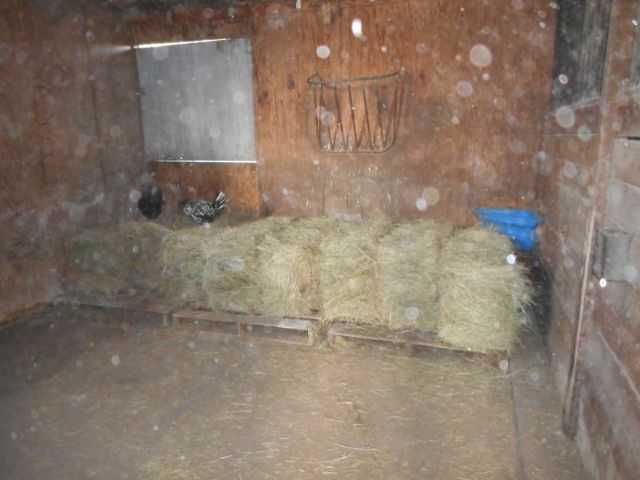 The wind huffed and puffed and tried to blow our house down last night! Thankfully it appears that the only damage incurred was a few branches strewn about and a tarp that tried to blow away. The power was out for a few hours, but came on just as I left for work. 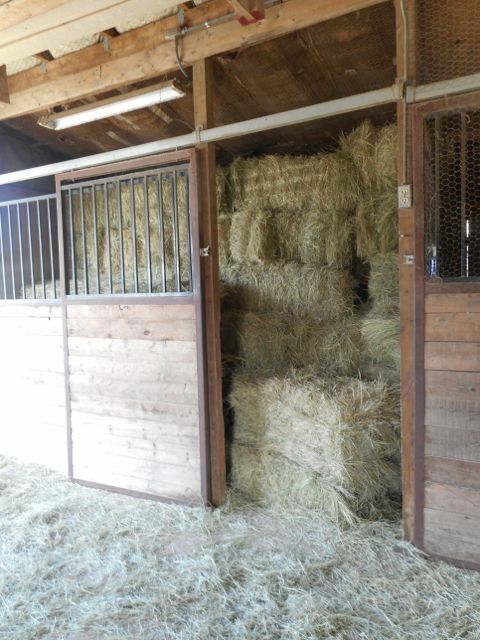 Yay for the house and tack room having AC today! We need to name this goat. He’s a whether and is pretty silly. 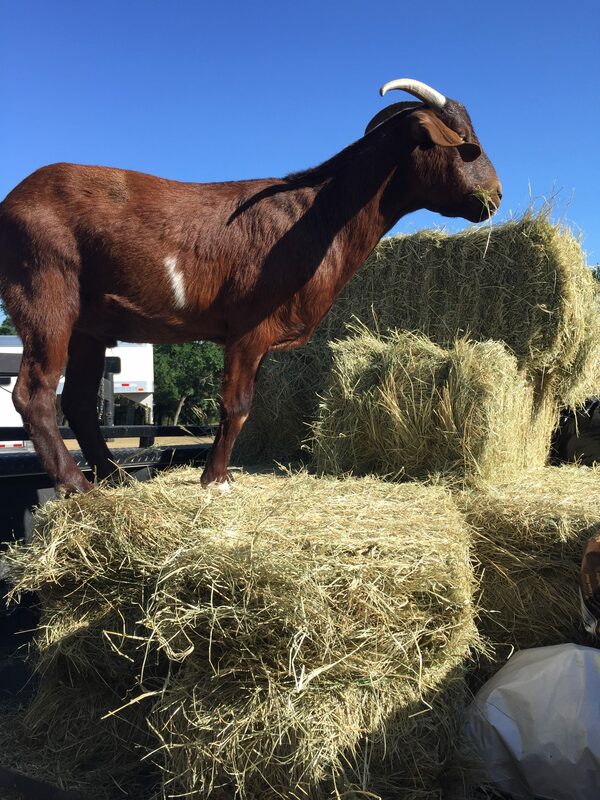 He enjoys helping unload hay. I built my cinder block container gardens a few years ago. We usually grow some squash or some onions or whatever, but since we started doing Blue Apron a couple years ago we don’t really need to grow our own stuff. 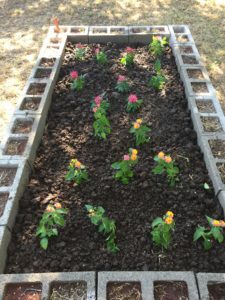 When I was outside last weekend I saw a hummingbird and it motivated me to plant some flowers. I snagged these at the feed store on Sunday. The donkey has eaten a few of the pink flowers, but the chickens have left them alone. 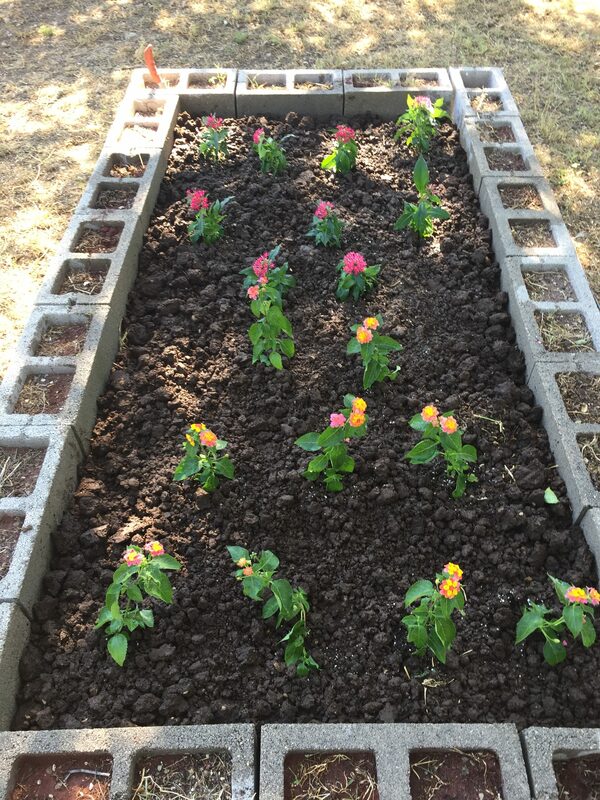 The taller pink and orange ones are Lantana and should get pretty big. If they live, that is. Simon has the prettiest face. Such a sweet boy. 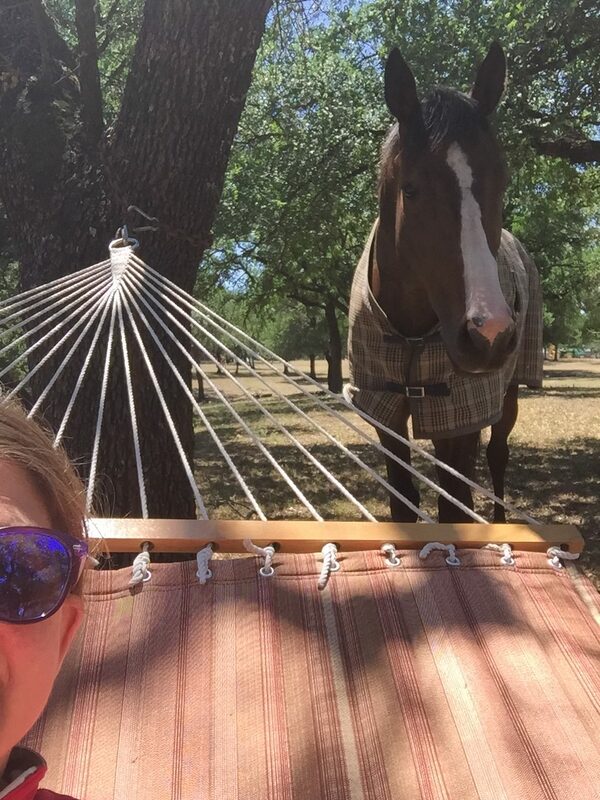 The horses are always curious when we put out the hammock. They walk by and pretend like they aren’t staring at it and somewhat terrified. Happy weekend! Do you have any fun plans? I have my fingers, toes, legs, arms and whatever other appendage will cross crossed in hopes of RAIN! It is much too dry right now. When Coco was born her dam (“mom” in human talk) was four years old. 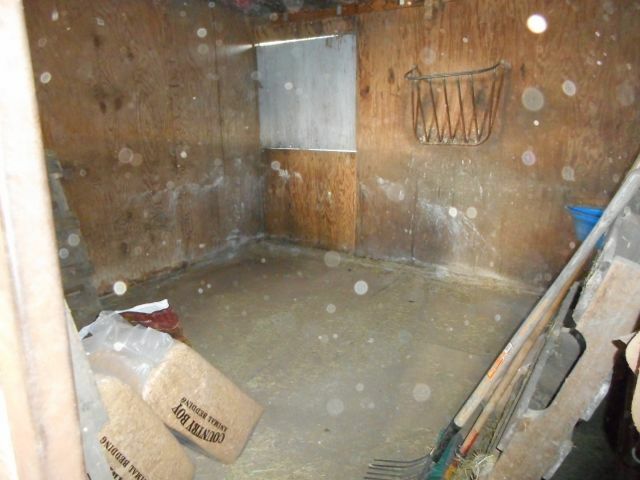 That means she was bred when she was three, which is relatively young for a horse. I keep in pretty close touch with Coco’s breeder and also know the gentleman who breaks their horses from mutual friends. The breeder told me that breeding the young mares often helps the mare to be calmer and less “marish” AKA bitchy. The breaker reiterated that Mai Tai (Coco’s mom) was much calmer and more submissive than younger mares often act when first getting ridden. Thus a seed was planted. 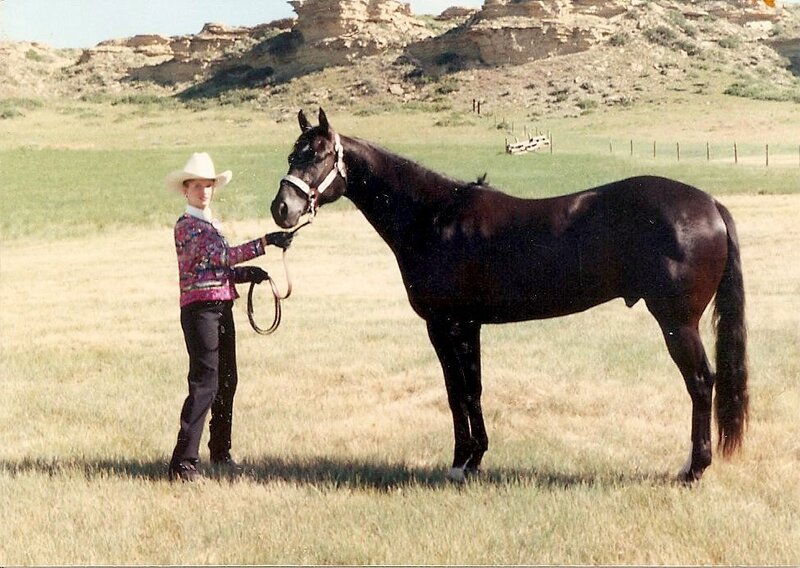 The whole reason I own Coco is because I had bought an older mare a few years ago for the sole purpose of breeding. After two breeding seasons and a LOT of vet bills I finally threw in the towel and bought a foal AKA Coco.You’d think after that miserable experience I’d have learned my lesson, but I haven’t. My parents raised horses and we had foals nearly every year I lived in Montana. I love being around the babies, teaching them all the basics and eventually riding and showing them. I value knowing every single experience the horse has ever had. I have no one to blame but myself if they missed something in their training. I also can’t afford to buy a $50,000+ show horse. Buying or raising foals makes much fancier horses significantly more affordable, if a bit more risky and time consuming. 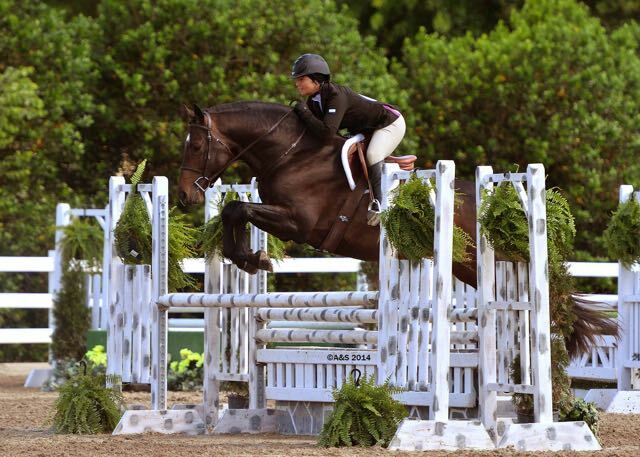 Coco is by a Thoroughbred stallion named Coconut Grove out of a mare by a Dutch Warmblood stallion named Mezcalero. 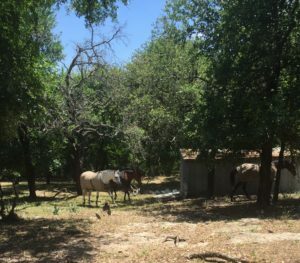 Both Mezcalero and Coconut Grove stood at the barn where I bought Coco. Her grand-damsire, Amaretto D, also stood there. She is registered with RPSI When planning what stallion I wanted to breed her to my biggest priority was temperament. I want a foal who is fun and easy to bring up and not super hot. I also have an affinity for Holsteiners. They are a German registry and many of the top jumpers are Holsteiners. Someday I’ll do a post (or 14) about warmblood registries. After growing up with Quarter Horses I’m still trying to figure out the whole warmblood registry thing. I follow a few breeders on Facebook and one stallion in particular had caught my eye. His name is Cartier R and he’s a Holsteiner imported from Germany. His breeder was running a fee special in 2013 so I talked to Coco’s breeder and asked if she thought it was a good cross. They had prepared and shown Cartier R at his Holsteiner stallion inspection so I knew they knew him and could give me good feedback. Coco’s breeder gave a thumbs up so I went ahead and paid the stud fee knowing it would be at least two years before Coco would be an eligible bachelorette. At the time I paid his stud fee Cartier was only four years old so definitely didn’t yet have any show experience. Since then he has shown in some jumper and hunter classes and gotten some good ribbons. 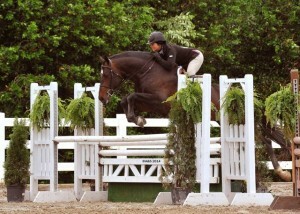 He started in the jumper arena, but has since move to the hunter arena which I actually prefer. My hope is that Coco or her foal will be a hunter. The jumpers still scare me. One thing about Cartier that I’m almost superstitious about is his single white left hind ankle. Jaguar has a single white left hind ankle and so does Coco. I’m convinced it is a sign of superior intelligence. If you want to read more about Cartier R you should check out Rising Star Farm. Coco went to the reproduction vet last week and I have my fingers and toes crossed and I say special prayers every night that she gets in foal easily, has a nice pregnancy and delivers a perfect filly next spring, also with a white left hind ankle. OK, I’d be fine if it is just a healthy foal. 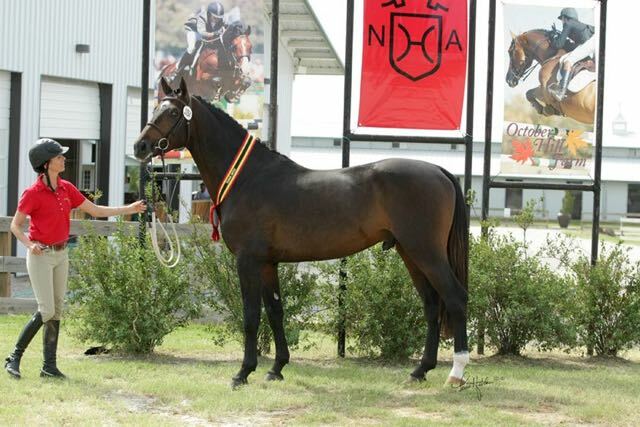 I’ll leave you with one last photo of the beautiful Cartier R. If you own a warmblood mare, you should give Ronda a call. She has a few lovely stallions on her farm. In the meantime think happy thoughts, so prayers, or do whatever you do to influence positive outcomes!